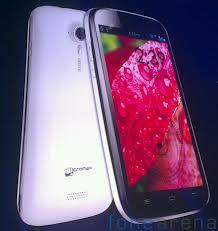 Micromax is the true creator of the low budget smart phones with special features. Micromax Company now started collaboration with MediaTek for brings their first quad core processor phone in this segment. A116 Canvas HD smart phone is the new device manufactured from the popular Indian smart phone designer. Micromax A116 Canvas HD is powered by MediaTek's MT6589 1.2 GHz processor with built in graphic acceleration. The official spokesmen said that world’s first commercialized quad-core Cortex-A7 SoC is included in the handset. Now the Micromax A116 Canvas HD smart phone comes with 5 inches HD IPS touch screen with 16.7 million colors. The bright display enables the full HD resolution (1280x720) with high grade ppi (pixels per inch) resolution. The handset runs Google Android 4.1 Jelly Bean operating system. 8 mega pixels rear shooter with auto focus and LED flash is the main attraction of the device which includes more vibrant geo tagging-face detection features. There is also a front VGA camera for video calling. 1GB of RAM and 4GB of internal storage are the memory options of the smart phone. There is a memory slot on the side panel of the 3G smart phone which for expanding its storage up to 32GB via micro SD cards. Micromax A116 Canvas HD carries a standard 2100 mAh Li-Ion battery which provides sufficient talk time and standby time. Micromax A116 Canvas HD is expected to be available in February. There no word about the exact price for this handset. According to the unofficial talks, it will be available for below Rs. 15,000. Fantastic tips as usual and you were right-- I haven't seen a lot of these before anywhere else! Thanks so much!